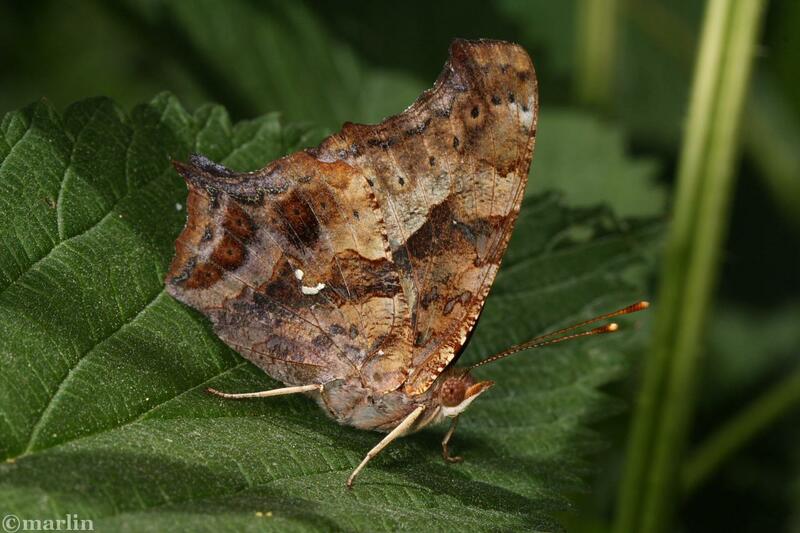 The question mark butterfly gets its common name for the “?” white marking visible in the above photo. The species epithet interrogationis has the same Latin root as “interrogation.” You can find this butterfly in woodland glades, roads and other sunny openings; orchards and along watercourses. It ranges east of the Rockies from Saskatchewan to Texas and Mexico and east to the Maritime Provinces and Florida. The question mark is alone among all anglewings in sporting pronounced tails. There are usually 2 broods in the north, and as many as 5 in the south from spring to autumn. Adults overwinter. Host plants includes nettles, hops, and the elms & hackberries in the family Ulmaceae. I love finding these butterflies in an early spring forest before the leaves come in. 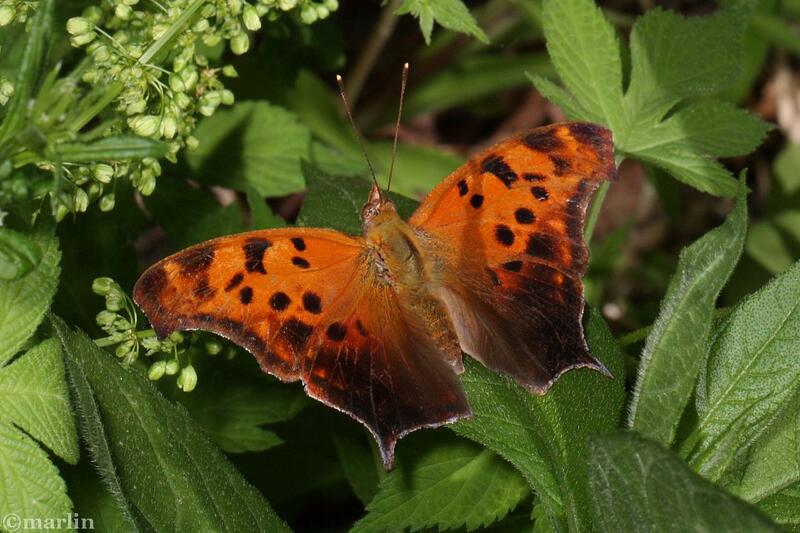 They are every bit as playful as their close relative, the eastern comma. Look for sunny openings in the woods where there are good sunny perches on the sides of trees, and you might get lucky. The anglewings have put on many a show for me, dancing with each other, upwards into the forest canopy and into the sky, out of sight – and reappear just as quickly to their favorite resting place. If you’re careful and watch where they are flying, plant yourself standing in the sun and don’t move for a few minutes. If you have calculated correctly, they might start landing on you as if you are a tree. Such gentle creatures! It is a treat for winter-weary eyes. Question mark takes moisture and minerals from sandstone pebbles. Adults can feed on rotting fruit, feces, and carrion but seldom take nectar at flowers and are not considered a major pollinator. Poop pollinator maybe. It is apparent from the two images adjacent that the question mark’s camouflage works equally in different environments. The dark-barred structure that crosses from the hindwings to the forewings can be adjusted in length to match the background it is resting against and as motion dazzle. It is used to mimic shadows of tree branches and to break up the butterfly’s outline. 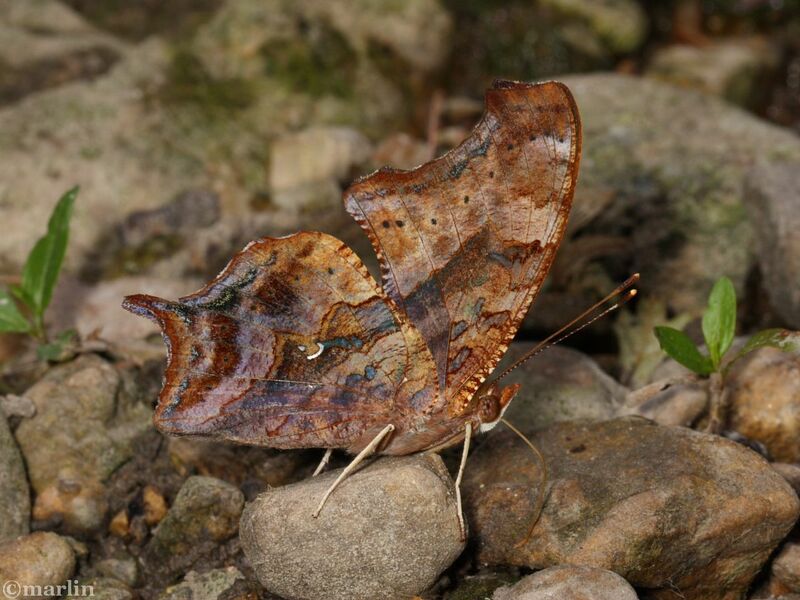 I discovered this phenomenon after photographing an American snout butterfly (another anglewing) in Texas. Think of the hundreds of thousands of generations that perished in the line of creating ever more effective camouflage! Family Nymphalidae – Brush-Footed Butterflies – Brushfoots encompass approximately 3,000 species worldwide, of which 160 or so live in or visit North America. This is a very diverse family of butterflies, and they occur everywhere except the polar ice caps. Their unifying characteristic is the reduced forelegs of both males and females. These vestigial forelegs are nearly useless for walking and give rise to the family’s common name.The habit of holding the forelegs close to the body is shared with many other insects, including some bumblebees, flies, bugs and beetles.